There is disagreement on where minimum wage should be set, but when full-time, minimum wage workers in Iowa fall below the poverty threshold—it cannot stay at $7.25. According to the U.S. Census Bureau, the 2014 poverty threshold is $16,317 for a two-person household. That’s $7.84 an hour. Also, the Iowa Policy Project estimates annual food, rent, utilities, clothing and household expenses for a two-person household to be $16,560 annually. That’s $7.96 an hour. Americans possess a sense of justice. We are also a generous people. There are dozens of government support programs for the working poor, supported by taxpayers. Effort, combined with generosity, can solve poverty. One income should support a two-person household. There are some who are not capable of working—children, the elderly, and disabled individuals. Despite our fierce independence in this country, we are not so individualistic that it becomes normal to think in terms of only taking care of ourselves. The hopeful norm is the belief that one person working a full-time, minimum wage job can support one additional person in the household, not capable of working, with those wages. Iowa legislators introduced a bill that would have raised minimum wage to $8.00 this year and $8.75 next year. The measure died. An hourly wage of $8.00 will simply meet the poverty threshold for a two-person household. Another 75 cents an hour will put an additional 30 bucks each week in the pocket of a full-time worker. According to the National Conference of State Legislatures, 29 states and D.C. have minimum wages above the federal requirement of $7.25. Of those already higher than the federal requirement, 15 have passed legislation to increase its state minimum wage again and will take effect within the next year or two. While it could be argued that some states are increasing minimum wages too much and too fast without full consideration of unintended consequences—particularly for small business owners—the Iowa bill was reasonable. Knowing that it takes at least $8.00 an hour to purchase the bare minimum of food, clothing and shelter, it’s reasonable to move to that amount as a state minimum. Our neighbors—Illinois, Minnesota, Missouri, Nebraska and South Dakota—all have minimum wages higher than Iowa. Increasing state minimum wage is trending upward. The National Federation of Independent Business warns that small businesses are the ones who will suffer the most, and if they suffer—the jobs will go with them. According to the Small Business Administration, small businesses make up 99 percent of U.S. firms and are responsible for 64 percent of new, private-sector jobs. These small businesses also have a 50 percent failure rate within the first five years, but some failures have nothing to do with labor costs. History has proven that many small businesses can adjust to the challenge of modest increases in the minimum wage. The time has come to do it again. Human beings who are doing their part and working full-time should not be falling below the poverty threshold. It’s difficult to call that working arrangement a job. Iowans can help by supporting small businesses in their communities. The consumer has power. And responsibility. Some may be hard pressed to think of even one person they personally know who is making minimum wage or one business that pays minimum wage. 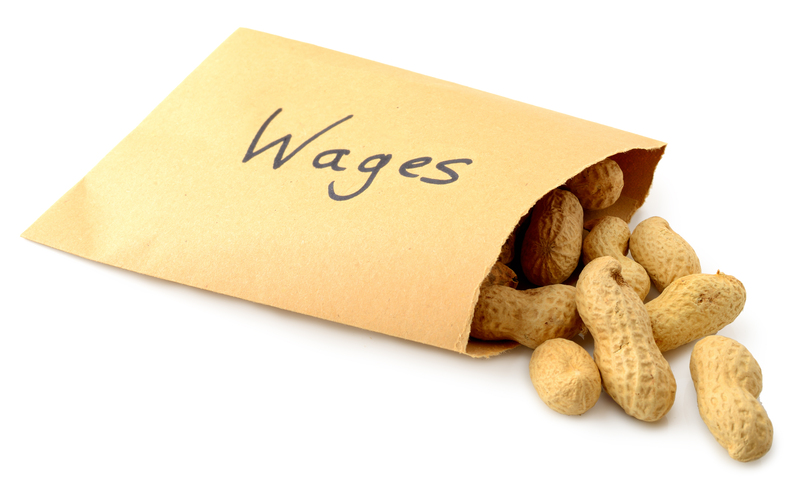 Workers are in demand, and often companies have no choice but to pay higher wages. Free market advocates will say the problem has already been worked out. If it’s a non-issue, there should be no opposition. Our legislators failed, and the failure was partisan with Democrats supporting the increase and Republicans opposing it. Partisan battles will and should happen when extreme, liberal or conservative factions are at work. But it’s not extreme to increase the minimum wage to $8.00 an hour. It’s reasonable. This problem isn’t going away. If more states make the choice to fix it themselves, perhaps the federal government will not feel the need to enforce a one-size-fits-all mandate. What works in the District of Columbia and the East Coast may not be what’s best for Iowa. When the issue of minimum wage is brought up again, let’s hope our elected leaders—despite their party affiliation—will find a way to do what’s reasonable. Because the current minimum wage doesn’t cover the bare minimum.